Both ecology and conservation biology seek to understand how variation in species distributions affect the functioning of ecosystems and the stability of food webs. This issue has become more pressing in a world experiencing rapid, and sometimes unexpected, declines in biodiversity. To date, most of what we know about species effects on ecosystems comes from experiments in single locations, where species occurrence is randomly perturbed. While such experiments tell us that species composition can be exceptionally important in determining ecosystem functions, they do not tell us if large-scale changes in species distributions will change, or have changed, ecosystem functions. To answer the latter question, we need replicated experiments over large spatial scales that consider either natural (e.g. biogeographic) or anthropogenic (e.g. climate change) patterns in species turnover. This has rarely been attempted. We are a formal international research network which conducts replicated experiments over both hemispheres. 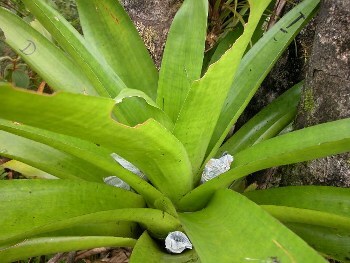 We aim to serve as a model for merging the fields of community ecology, biogeography and phylogeny by taking advantage of an ecosystem that is naturally replicated from Florida to Argentina: the faunal food web inhabiting water-filled bromeliads. This system is especially amenable to studies of food web structure and ecosystem function. 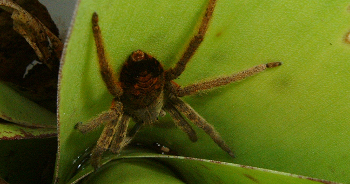 As it is small, it can be completely censused, yet still contains multiple trophic levels from bacteria to dragonflies. Moreover, there is a strong biogeographic gradient from depauperate communities in the Caribbean, to medium diversity in Central America and Argentina, to exceptionally high diversity in tropical South America. * to develop experiments that will be replicated at five sites to examine if biogeography affects the functioning of the food web, or whether convergence in community structure ensures that food webs are functionally similar. * to use existing survey data to examine if biogeography affects the structure of food webs, as well as the role of particular species in driving dynamics of the study system. 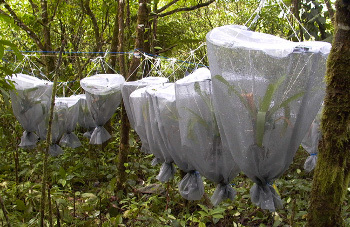 * to develop a methodology to quantify the relative roles of dispersal, speciation and local interactions in determining the phylogeny of invertebrates living in bromeliads.